Located in the foothills of Annamalai Hills, Tiruvannamalai is a beautiful town in the state of Tamil Nadu and is popular amongst tourists for its age-old temples and highly revered religious sites. Therefore, it is also sometimes referred to as the temple town of Tamil Nadu. However, it is also has a rich history as it is believed to have been founded hundreds of years ago during the reign of the Chola dynasty. Since then, it has been ruled by several other dynasties including the Hoysalas and the Tuluvas. Today, the town is visited by thousands of pilgrims every year. Tiruvannamalai is said to be the place where Lord Shiva appeared in the form of a light. Therefore, it is considered as one of the most significant sites amongst Shaivites. Following is the list of the major places which can be explore and savoured while in and around Tiruvannamalai. The most significant site in Tiruvannamalai, Annamalaiyar Temple, otherwise known as Arunachalesvara Temple, is a pilgrimage site amongst Hindu devotees. The temple is dedicated to Lord Shiva in the form of a linga and his consort, Goddess Parvati. Every year, the temple is frequented by thousands of tourists. As per historical records, the temple has a history dating back to the 9th century. However, as per Hindu mythology and local legends, it is said to have been founded thousands of years ago. On account of its great historical as well religious prominence, Annamalaiyar Temple cannot be ignored while in Tiruvannamalai; otherwise, the your visit to the town would be deemed incomplete. Annamalai Hills is the spot where Lord Shiva appeared in the form of a light. Hence, the region of Annamalai Hills is considered as a holy site amongst Hindus. However, over a period of time, these hills have also gained immense popularity amongst nature lovers and landscape photographers. Today, Annamalai Hills is one of the most frequented places in the town. These hills are located on the outskirts of Tiruvannamalai and are blessed with lush green vegetation. You must visit it if you would love to experience the beauty of divinity and tranquillity simultaneously. Sri Ramana Ashram is another place of religious significance in Tiruvannamalai. It is a beautiful ashram in the foothills of Annamalai Hills and is home to the Samadhi of Ramana Maharshi, a great sage and philosopher of the Modern Era. Today, thousands of tourists visit this beautiful spot to seek peace and composure. If you are looking for a place in Tiruvannamalai where you can find yourself lost in the deep valleys of serenity, then this ashram is the ultimate place for you. Here, you can also learn in detail about the life of Ramana Maharshi. If you would love to explore beyond the main boundaries of Tiruvannamalai, then you can plan a visit to Tirukoilur, which is located at a distance of about 20 km from the main town. It is popular amongst locals and tourists for Ulagalantha Perumal Temple, which is dedicated to Lord Vishnu and is also known for commendable architecture. Like Tiruvannamalai, it also has a history dating back to the Chola dynasty. Most Read: Have You Ever Been To These Charming Hill Stations In Tamil Nadu? Tirumalai is an ancient cave complex which houses caves, temples and a few sculptures. These structures are believed to have been built in between the 10th and 12th centuries. 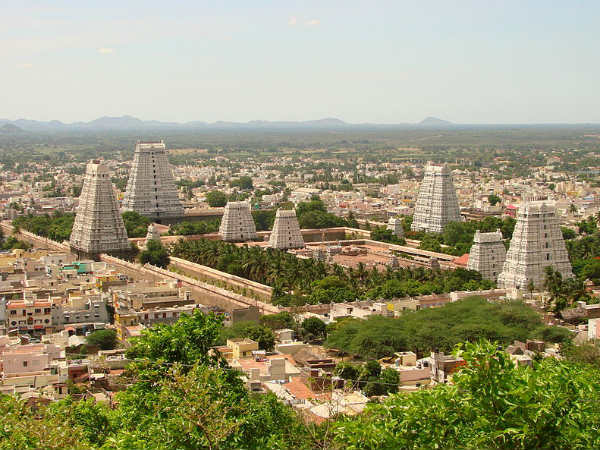 Therefore, Tirumalai is a must-visit destination for every history lover. The beautiful patterns, paintings and carvings on the walls of the caves and the temples certainly deserve to be scrutinised. So, what do you think a visit to Tirumalai this season?